NOW Foods MK-7 Vitamin K-2 Veg Capsules contains a highly biologically active form of Vitamin K2 derived from non-GMO natto, a traditional Japanese fermented soyfood. Vitamin K is well known for its role in the synthesis of a number of blood coagulation factors. During recent years however, Vitamin K2 and its dependent proteins have been found to play a central role in whole-body calcium metabolism. These Vitamin K2-dependent proteins are now known to be essential for normal bone mineralization, as well as for other critical functions unrelated to coagulation. Directions: Adult Dosage: Take 1 capsule daily with a meal. Non-Medicinal Ingredients: Rice Flour, Veg Capsule (hypromellose, water), Ascorbyl Palmitate and Silica. Caution: Consult a health care practitioner prior to use if you are taking blood thinners. Do not use if you are pregnant or breastfeeding. I trust this brand in using superior ingredients! I am happy with it so far. I know how important Vit K2 is, in proper absorption of calcium. This is a very important supplement. One of its many benefits - it encourages aging healthier. 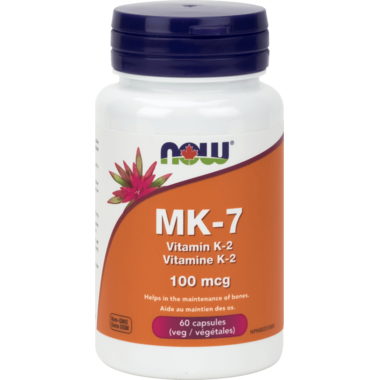 Excellent product for over all health, we need MK-7 as we age, its an anti-aging vitamin. Highly recommend buying from well.